A government-appointed expert committee has proposed doubling the national-level minimum wage for a worker in the country to Rs 9,750 a month, up from a floor of Rs 4,576 at present. The committee has alternatively proposed a national minimum wage at various regional levels in the range of Rs 8,892-11,622 a month (depending on local factors) and suggested an additional house rent allowance for urban workers. The report of the expert committee, led by V V Giri National Labour Institute (VVGNLI) Fellow Anoop Satpathy, was made public by the Union labour and employment ministry on Thursday. The labour ministry has put up the report, titled “Determining the Methodology for Fixation of the National Minimum Wage”, on its website for initiating stakeholder consultations. The committee has drawn the minimum wage estimates at the national and regional levels based on an “improved” formula, keeping in mind the likely spending by workers' families on a mixed basket of balanced-diet meal and non-food expenditure. “On the basis of this approach, the committee is of the considered view that the single value of the NMW (National Minimum Wage) for India should be set at Rs 375 per day as of July 2018,” the committee report said. Considering a worker works for 26 days a month, the minimum monthly wage came to Rs 9,750, it said. This wage-level is irrespective of sectors, skills, occupations and rural-urban locations for a family comprising 3.6 consumption units, according to the report. Over and above the minimum wage, it recommended an additional house rent allowance of Rs 55 per day, i.e. 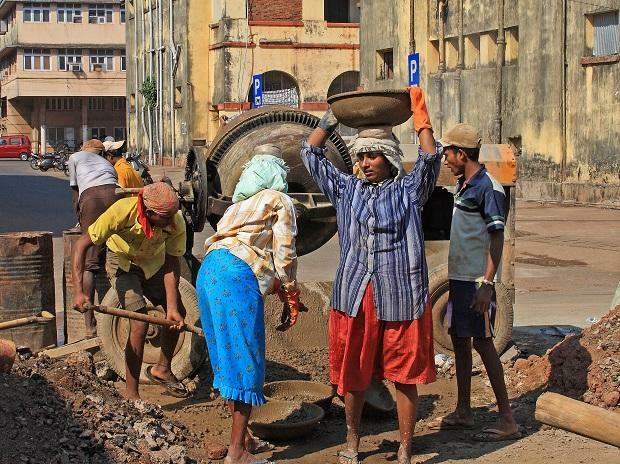 Rs 1,430 a month for urban workers. The national floor level was last revised by 10 per cent to Rs 176 a day (or Rs 4,576 a month) in July 2017. This floor is, however, a recommendation from the central government and is not legally binding on states. The committee's proposal is a departure from the present methodology adopted to compute minimum wage. At present, each state can set its minimum wage for various industries, based on daily spending estimates for a working class family on 2,700 calories of food per person, 72 yards of clothes, minimum housing rent and education, and light and fuel, as prescribed by the Indian Labour Conference in 1957. The present methodology, followed by most states and the Centre, factors in a calorie-based diet for estimating the household expenditure of a worker (considering a consuming unit of three). However, according to the committee's proposed formula, a family with a consumption unit of 3.6 requires 2,400 calories of food, along with a minimum of 50 gm of protein and 30 gm of fat every day, according to the National Sample Survey Office's consumption-expenditure reports. The committee has proposed a reduced intake of calories for calculating wages because it found, through empirical evidence, households were relying on a mixed basket of food and consuming less calorie due to a “reduction in the proportion of workers engaged in heavy work and an increase in the number of workers in moderate and sedentary occupations”. Further, the report proposed the minimum wage included reasonable expenditure on “essential non-food items” such as clothing, fuel and light, house rent, education, medical expenses, footwear and transport. The committee has recommended a minimum wage for five different regions with diverse socio-economic and labour market situations as an alternative to a national-level minimum wage. Four of these five regions were grouped using varied socio-economic and labour market factors, while the fifth group included all North-eastern states except Assam. “A regional NMW calculated in this matter would have the potential to address varying economic situations in different states,” the committee said. The socio-economic factors considered to group major states into five categories were state income, cost of living, labour market situations, and levels of women’s empowerment. The region-wise minimum monthly wage prescribed by the committee is higher than the current minimum monthly level seen in most states. Except Delhi (Rs 13,988) and Andaman and Nicobar Islands (Rs 11,366), no state has a minimum wage higher than what has been suggested in the report. The committee, however, said states with a higher minimum income than the prescribed rate may not be allowed to reduce it. The committee's recommendations will be taken up by the Central Advisory Board (CAB) on Minimum Wages, headed by Union Labour and Employment Minister Santosh Kumar Gangwar. However, the proposed minimum wage will remain a prescription for the state governments in accordance with the mandate of the existing laws. The labour ministry had proposed a statutory minimum wage at state and regional levels through a Code on Wages Bill, which couldn't be passed by Parliament under the present government's tenure. At present, states fix minimum wages for workers based on their skill sets — skilled, semi-skilled and unskilled. But the committee said a different panel might be set up to recommend skill-wise wage rates of workers. In India, minimum wage across states has wide variations. For instance, it stood at Rs 1,794 a month in Arunachal Pradesh and Telangana but at Rs 8,476 in Haryana and Rs 9,100 in Chandigarh, as of November 2018. “The states that currently have lower wage rates than the national minimum wage may start by fixing a NMW that is equal to the NMW average for the region to which they belong. They may like to catch up with the national average in the near future,” the report said.